Hancock’s War History reveals its tragic past—from Sand Creek to Medicine Lodge. Frederic Remington’s Battle of Beecher Island illustrates the violent and deadly encounter between Roman Nose’s Cheyenne, Sioux and Arapaho warriors and U.S. Army troops from Fort Wallace on September 17-19, 1868, an incident that typified the skirmishes and battles of Hancock’s War in Western Kansas and Eastern Colorado. Second Lieutenant Lyman S. Kidder, 7th Cavalry, was unlucky. I knew that before beginning this road trip, but as I step out of my Jeep in a remote section of Western Kansas, I’m struck by just how far Kidder’s bad luck reached. In the summer of 1867, Kidder was ordered to take dispatches to Lt. Col. George Custer. Instead of finding Custer, Kidder and his men—ten troopers and a Lakota scout—ran into a party of Lakotas and Cheyennes. The soldiers and the scout were killed on or near July 2. Some of the soldiers had been tortured. All had been mutilated. The scout, Red Bead, had been killed, but only scalped. That’s what Custer discovered at what became known as the Kidder Massacre site. The dead were first discovered by Custer’s scout, Medicine Bill Comstock. And what happened to Medicine Bill? Well, he was killed by Cheyennes near the Solomon River in August 1868. 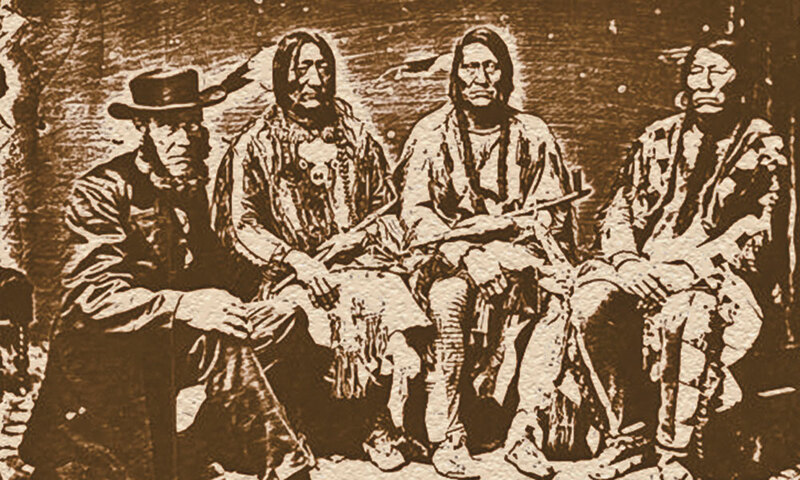 Cheyenne leader Black Kettle (third from left) was a promoter of peace, but despite his perseverance, he and his wife were shot in the back while retreating at the Battle of Washita River on November 27, 1858. Because of the condition of the corpses, Custer ordered the bodies buried in a common grave. Kidder’s father, a Dakota Territory judge, wanted his son’s body given a fitting burial for an officer, so he sent a swath of fabric that Kidder’s mother had used to make her son an undershirt. Custer recognized the cloth. So soldiers returned to the site to disinter the dead on March 1, 1868. Kidder’s body was identified from his undershirt, and he was reinterred in the family plot in St. Paul, Minnesota. The others were reburied at Fort Wallace and later reinterred at Fort Leavenworth National Cemetery. The officer leading that detail was none other than Lt. Fred Beecher. His fate? The next year, Beecher was killed by Cheyennes in a battle in Colorado at a place that became known as Beecher’s Island. Need I tell you what happened to George Custer in 1876? But, wait, there’s more. In 1877 Indians reportedly killed three buffalo hunters not far from where Kidder and his men died. Tell me that’s not bad luck for anyone who came close to Kidder. Of course, the Kidder Massacre and those subsequent deaths might not have even happened if not for a zealous, bloodthirsty militia commander named John Chivington. 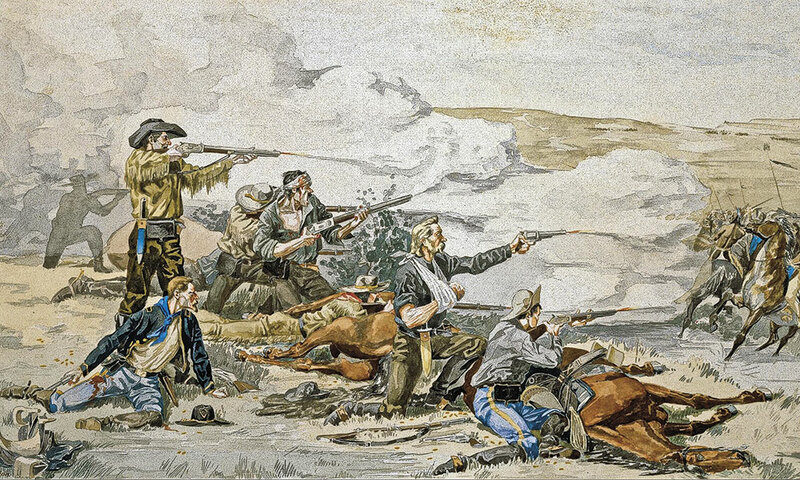 The Southern Plains tribes fought the U.S. Army in the Hancock War to retain traditional Plains hunting grounds, such as the Cimarron National Grassland in the southwestern corner of Kansas. The grasslands are located north of the Oklahoma Panhandle and due east of Comanche National Grasslands in southeastern Colorado. 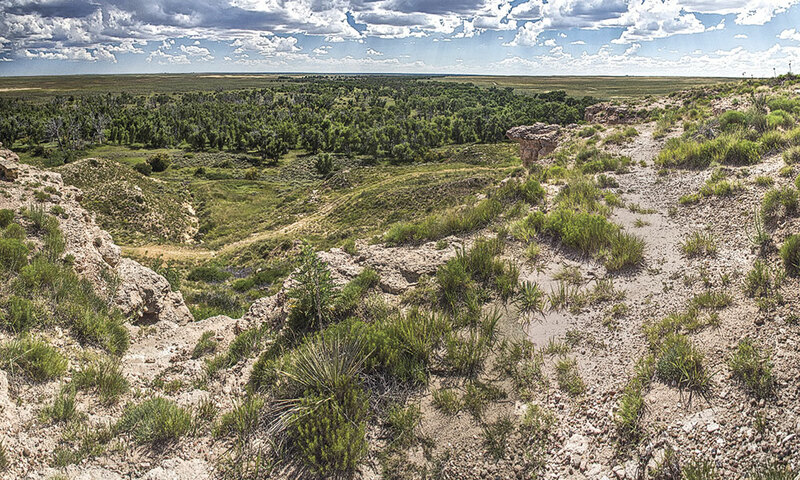 To understand the bloodshed of 1867 in Kansas and elsewhere, start this road trip at Sand Creek Massacre National Historic Site in southeastern Colorado. The slaughter of Cheyenne and Arapaho Indians, mostly women and children, on November 29, 1864, fueled unrest and retaliation. Chivington, deservedly, got the blame. But Gen. Winfield Scott Hancock did not help matters. Not satisfied, Hancock then decided to give other Indian leaders a show of force, which he led west to an encampment of Lakotas and Cheyennes. Seeing bluecoats and remembering Sand Creek, the Indians fled. Hancock decided that the abandoned village had been “a nest of conspirators.” He ordered the village burned. 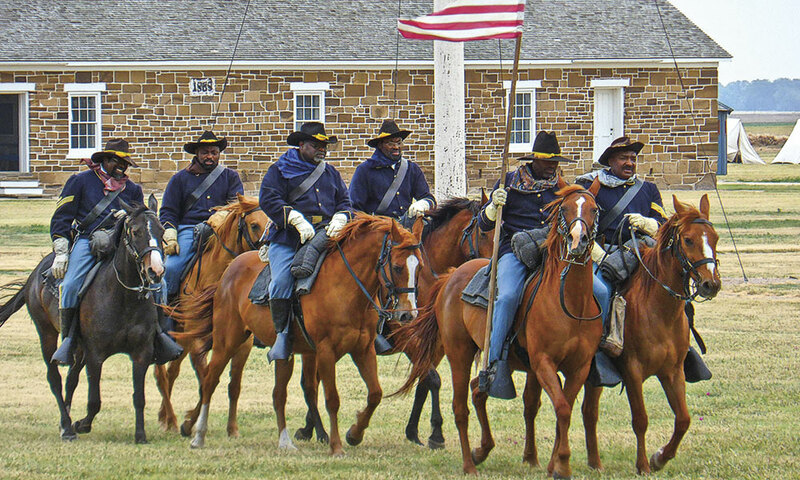 In 2017, Buffalo Soldiers re-enactment groups celebrated the 150th anniversary of the highly decorated black troops who served in the West, including the U.S. Army’s 10th Cavalry at Fort Larned National Historic Site. That set off a summer of violence—battles and skirmishes near Fort Dodge (June 12) and Fort Wallace (June 21-22). The New York Herald published a gruesome article about an attack near Cimarron, Kansas. Cheyennes had attacked a Santa Fe-bound wagon train commanded by Francisco Baca, and the Indians had killed Bishop Jean Baptiste Lamy and ten other priests. The Indians also kidnapped six nuns. that summer, but withdrew after seven hours. According to some reports, the Indians took 50 mules, but no nuns. Lamy escaped unharmed to go on to Santa Fe and eventually earn literary immortality in Willa Cather’s Death Comes for the Archbishop. U.S. Army troops stationed at Fort Wallace, established in the fall of 1865, were at the forefront of the action of the Hancock War. While the fort is gone, visitors can tour the old Fort Wallace Cemetery and the Fort Wallace Museum. The Cheyennes also came up with an attack straight out of a B-Western. A roundhouse was being set up in Brookville, and the Indians decided to destroy it,the crews and all the engines. An eastbound train out of Fort Harker saw the war party and warned the railroad men in Brookville, so the workers and families gathered inside the building. The Indians decided to burn the building to the ground. The workers realized what lay in store, but, luckily, one of the locomotives remained under steam. Refugees boarded the train, the fireman got the boiler ready, the engineer hit full throttle, and the engine blasted through the door and steamed toward Salina. The Indians became unnerved and fled. Now, if I were a screenwriter in Hollywood around 1954, I would have sold that one to Columbia. George Montgomery as the heroic railroad detective. Yvonne De Carlo as the girl heading west. And James Griffith, that wonderful character actor, as the drunken engineer who saves the day. It would’ve been mediocre—because Columbia would have given it to William Castle to direct—but fun to watch after a six-pack of Old Style. 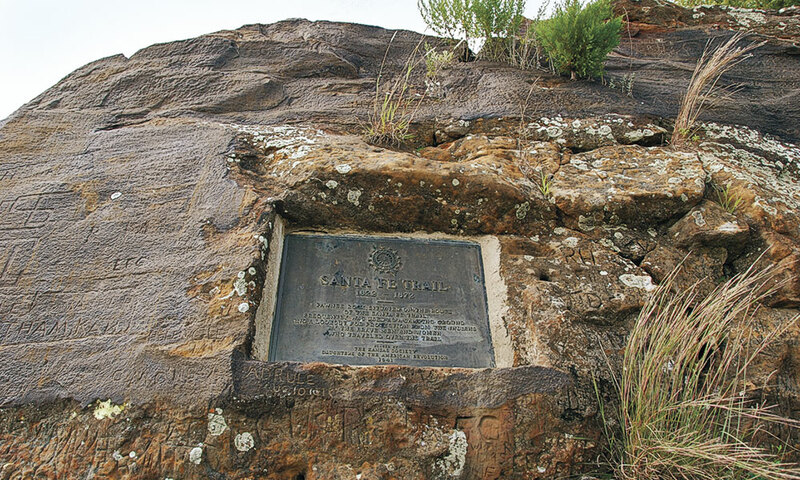 Generations of Plains tribes and travelers on the Santa Fe Trail encamped near, and fought over, the natural landmark Pawnee Rock, a key water stop, camp site and high point on the plains adjacent to the Arkansas River in central Kansas. 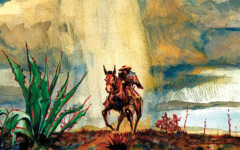 But the problem with Hancock’s War is that few people remember the fights: Pond Creek Station…Black Butte Creek…Saline River…Prairie Dog Creek…Davis’s Fight. Brookville lost its roundhouse to Junction City. Pond Creek Station was moved to Wallace. A few historical markers might be found, but the actual sites are remote and/or on private property. Even Fort Wallace is little more than a memory. But history is alive, if you know where to look. Like the greatly improved and expanded Fort Wallace Museum. 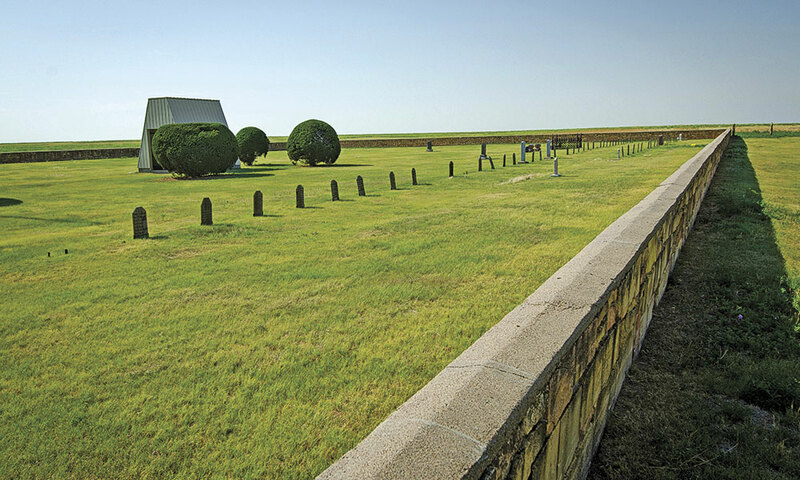 The Pond Creek Station sits just west of the museum’s main building, and while the fort is gone, the post cemetery is well worth a visit, too. Soldiers erected a monument to honor their comrades who fell during Hancock’s War. Fort Hays once boasted 45 major buildings. Only four remain, but Fort Hays State Historic Site offers a good look at frontier military history. The fort remained active until 1889. The Custer House is currently the home of the superintendent of the Fort Dodge Kansas Soldiers Home. 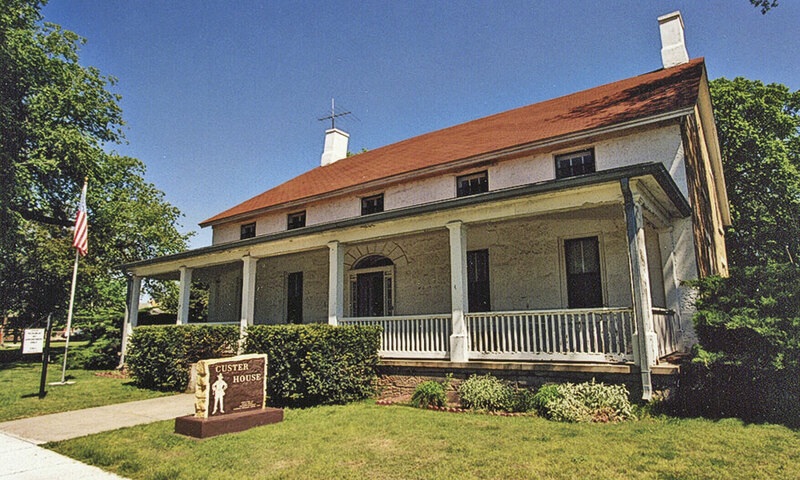 George A. Custer never lived in the house, but he was stationed with the 7th Cavalry at the key outpost on the Santa Fe Trail. There’s not much left of Fort Harker, either, but the Fort Harker Guardhouse Museum, near Ellsworth, is worth seeing, just to hear the stories of interpretive guide Greg Heller. Larned benefitted because the property became part of a working ranch in the early 1900s before the National Park system took it over in the early 1960s. Fort Dodge, which became the Kansas State Soldiers Home in 1890, has some original buildings, too, and the post museum is small but informative. Also on the grounds is the Custer House, and, yes, Custer was briefly at Dodge. The soldiers home’s superintendent lives in the Custer House now. Custer never did. But the best story is saved for Medicine Lodge, where peace came to Western Kansas with the signing of the Medicine Lodge treaty in October of ’67. A peace commission met first with a few tribal leaders at Fort Larned. Indians insisted that the talks be moved to the Medicine Lodge River. After deliberations, Indian and U.S. leaders, who agreed that Hancock had acted foolishly, signed treaties. 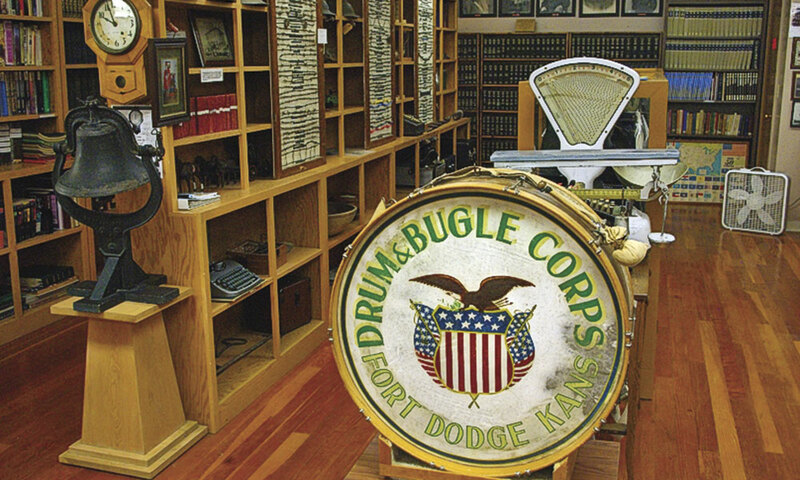 Visitors can tour the grounds of the Fort Dodge Kansas Soldiers Home during daylight hours, and a small museum in the library every day between 1-4 p.m. In a town known for a whiskey-keg-bashing crusader named Carrie Nation and a gunman-turned-lawman who became a bank robber and was gunned down trying to escape a lynch mob named Henry Brown, the treaty is honored with Peace Treaty Summer Days held every September, and the Peace Treaty Pageant Reenactment every third year. Black Kettle, a Cheyenne “peace” chief who had survived Sand Creek, was among the slain during Custer’s attack at the Washita River the following year. Kiowa Satank was shot dead by soldiers in Fort Sill in 1871. Kiowa Satanta committed suicide in the state prison in Huntsville, Texas, in 1878. As far as we know, none of those ever had anything to do with Lt. Kidder’s dead body. Johnny D. Boggs can’t pick which he enjoys more: history lessons from Ellsworth’s “Cowboy,” Jim Gray, or from Dodge City’s “Marshal,” Brent Harris. So he recommends both. 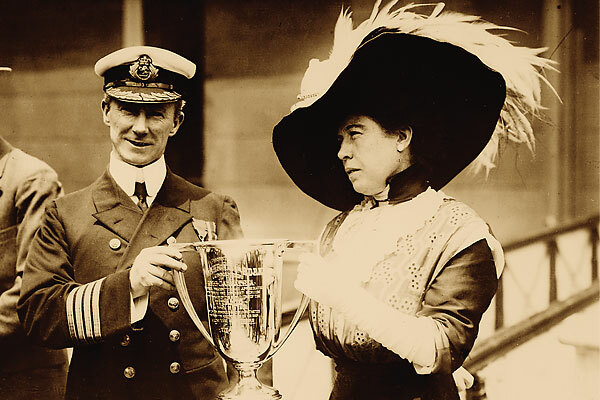 Unsinkable Margaret Brown The true history of Denver’s leading lady, in this anniversary year of the famous steamship disaster. Was the Apache Kid never caught?